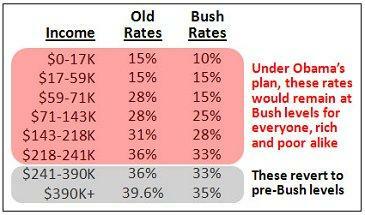 If your family makes $250,000 a year, under Obama’s plan, every penny in income will get the tax break. If your family makes $260,000 a year, under Obama’s plan, you’d get the tax cut for your first $250,000, then pay slightly higher taxes on the $10,000. As a result, everyone with an income would get a tax break. Even those at the very top would end up paying less in taxes than they did under Clinton because Obama would still give them a break on their first quarter-million. Good explanation, but there is still one key point left out. It takes an income closer to $300,000 to have a taxable income of $250,000. Few people earning over $200,000 aren’t putting a good chunk of income in retirement accounts, and there will be other tax deductions such as mortgage interest and local taxes. This reduces even further the number of people who will have to pay an extra 3 percent on a portion of their income. Besides, as a business owner, I would also point out that minor changes in taxes have zero impact on how many people I hire. I hire employees based upon what is needed for business purposes. I’m not going to avoid hiring another employee if one is needed should I have to pay a few hundred dollars more a year in taxes if taxes are increased. 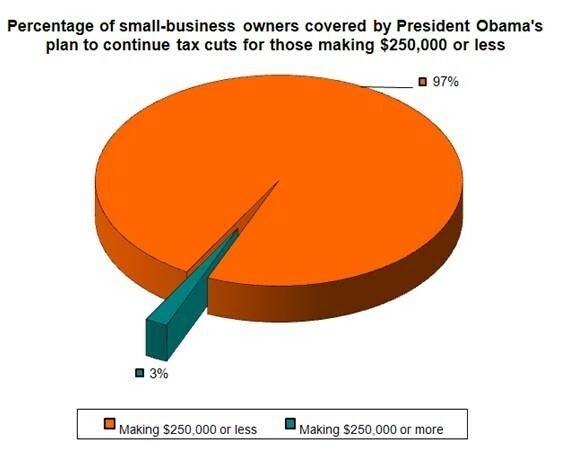 Democrats are also offering more tax breaks for small business as well as the middle class, but even without these breaks I’d be willing to pay a few hundred dollars more a year in taxes under the Democrats as opposed to voting for a party which is anti-science, pro-theocracy, and hostile to individual liberty.